Now the weather has got a bit colder and I’m starting to think about investing in my yearly pair of ear muffs (I somehow manage to snap them at the end of every winter) I thought it was about time I whipped up my first soup of the autumn. This is a gorgeous soup recipe which tastes like a real treat but at only 2sp per portion its a bargain smart points wise, especially considering the gorgeous smells and taste that ooze out of it! Pop your chorizo in a large heavy based pan, spray with 1kal and fry until the oils start to release. Add the onion, carrot and cumin powder and fry for around 10 minutes until the onions are nice and soft. Add the garlic and fry for another minute and then add the paprika, chillies, Moroccan seasoning, cayenne pepper and sugar. Simmer for a few seconds and then add the lentils, tomatoes and chicken stock. Season well with salt and pepper, give a good stir and simmer for 40 minutes. Take off the heat and blend with a stick blender adding a little water as you go to loosen the soup to the consistency you like. Serve with a drizzle of fat free natural yoghurt or light sour cream! Sticky Five Spice Pork Stir Fry – Only 10sp! This looked so nice pre blending that we had it as a stew and it is lovely. My husband loves the texture of lentils and I didn’t want to lose that. He said it was great in a food flask for lunch at work. You are a very clever lady. Thank you. Made it again last week but blended it as you suggest. Can’t decide which way is yummier. Both versions are lovely. I agree, I often have it one way and then the other way a few weeks later – change it up a bit! So pleased you enjoyed it Lindsay, thanks for letting me know and do let me know if you try anything else! That’s 2 or 3 carrots right? Not 2/3 of a carrot? I really hope so since it’s on my stove right now lol. Oh my lord this was soooo good, I love all the strong flavours in it. Flex hasn’t started yet here in Canada (Dec 3) but I’ve been looking at Flex friendly recipes in preparation. 2sp for this?? Yes please! Looking forward to trying other recipes from your site. Amazing soup.. so tasty.. ticks all the boxes.. I am going to try it with chicken for an evening meal. Can this be made with green lentils instead? Just made this and it’s delicious! Just made this in my soup maker and it was delicious. Fried off the chorizo and spices then just put this with all other ingredients straight in! Having searched for WW recipes(I love a recipe) I came across your page. All your recipes look amazing. I made this soup today and it did not disappoint it was delish. Looking forward to making the Chicken Pathia tommorrow night for dinner as this is what I would normally order from the takeaway. Just made this soup and it absolutely delicious! Looks gorgeous. I can’t find the Moroccan spices, so what could I use instead and what ratios would they be please? 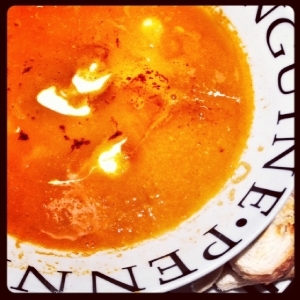 I make lots of soups….currently butternut squash and red onion being the favourite….however, this soup is delicious and will be another one of Laura’s recipes in my weekly menu. Ah so glad you like it Lora and thank you! This soup is souper-dooper! Absolutely lovely. Thank you Laura.